What is happening to this country ??? Nothing seems to be in order. 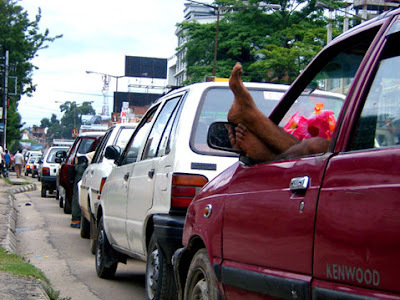 I was just passing through some blogs and man oh man...how everybody is suffering from the fuel crisis ? The most severly suffered are none other than the general public who have to use the Public Transportation for their daily use. It's just a few days back time, when my brother asked a Taxi Driver to go to Mandikhatar from Dhumbarahi, Pipalbot; he so surely asked for NRs. 200. This is such a shocking price as its' mere 1km distance. Then again, it's the same answer everybody is giving. "दाई पेट्रोल नै छैन । पैसा बढी दिने भए मात्र जाने । खाली फर्कनु पर्छ । " Even though there are people who just hope that there is one empty cab waiting. Same thing is happening on Microbus as well. We are students and when these Transport entrepeauners were getting 40% on their income tax for giving 33% discount on travel fare; why are they hesitating to do so in this crisis ???? Aren't they taking undue advantage of the poor condition of the country ??? But again, when I reached Naxal, I saw this line of vehicles queing up for their turn to get Petrol and Diesel. I got nothing to say then when the 'Khalasai Bhai' asked me "Dai, yetro line ma tapai basera petrol lina saknu hunchha?" I just gave an empty look to the 'Khalasi Bhai'. hope to read more about others things.